Have you ever heard the Robot Rides? Or sometimes you may just hear that it was called “Battle King Robot Rides”. This playground equipment belongs to a large kind of recreation equipment, while it was still considered as one of the best playground equipment. Normally, you can find such a robot in various places like tourist events, game centers, amusement park, outdoor park, and supermarket. However, some people may never hear the robot rides before. What is a robot ride? How does it work? What are its features? Now, we will give a brief introduction to this kind of awesome playground equipment. What is a robot ride? As one kind of walking robot equipped with a large laser, the robot rides can simulate a scene of entertaining and competitive battle games. It is usually accepted as one kind of recreational playground equipment. You may have gone through many kinds of walking products before. And you can also take this as the newest kind of walking products. 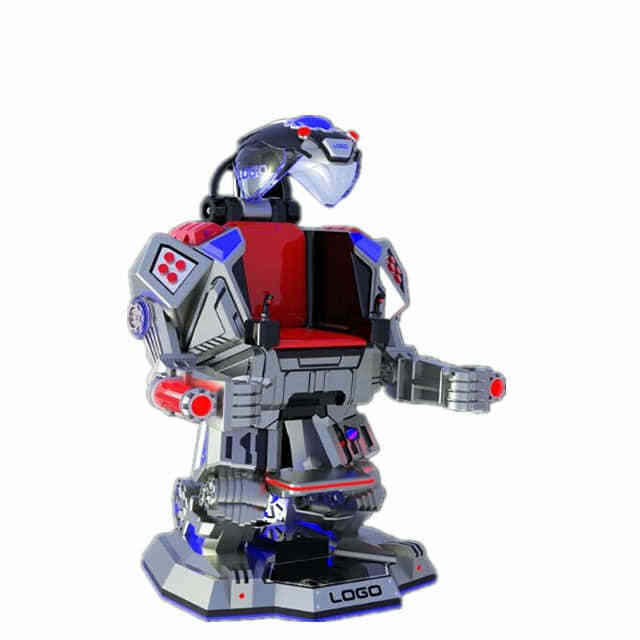 Usually, the major parts of robot ride usually include the head cover, joystick, fire button, chair, security radar, card panel, pedal, safety belt, power switch, handle, charging plug, LCD display, set panel, and multiple lights settled in different locations. Followings are the introductions of some of these major parts. When you are getting ready for a simulated battle sitting in this robot ride, you have to pull the joystick to head for different directions. The joystick always remains in a great sensitivity to help you move toward different directions. Pushing on the joystick to different spots, you can make it move forward and backward, as well as turn to left and right. Still not enough, those little adventure boys or girls can also try the rotation of 360 degrees. That will sting their sporty nerve and impose them scream loudly. Usually, you can see a small red button built in the joystick, and you can press down on this button to start fighting mode. When you are going to ride this robot ride, you have to swipe your card that you can buy it from the front counter. Usually, you can see the swiping area at its left leg, right below its left arm. Most of the robot rides, they usually have a base that weighs 200 kgs. It seems this kind of robot ride has a bulky base and hard to move fast. In fact, the reason why it has such a bulky base is that it has a heavy upper body, which needs a strong base to support its standing. In this way, the robot ride won’t collapse easily. What’s more, such a bulky base won’t be a big obstacle that will obstruct its moving. Exactly, you can always see the robot rides move at a relatively high speed, which is enough for cheering those fighters. Between its two legs, you can see the controlling panel, which is used to adjust music volume and speed. On the panel, there are many buttons along with vivid labels for you to make the corresponding adjustment. When it comes to music, different people usually like to enjoy music in various volumes. So, they can use the volume button to satisfy their needs. Another one factors involved in the simulated battle refers to the speed. Sure, as one of the fighters, if you move at a low speed, you may be defeated soon. However, for those young kids, they usually cannot adjust themselves to moving of high speed. Considering this, they can lower down the speed through choosing the different gear by the button on the panel. Before your battle, remember to check the control panel to see if the music volume and the gear are the ones you want. However, one who tries this robot ride for the first time usually doesn’t know the exact gear he or she just wants. Thus, he or she should to have a preview fist. Only sitting in the machine, you can find out what kind of speed is suitable for you. Just like driving a car, you have to buckle the safety belt first before your driving. Before starting to move, you also need to buckle your safety belt to ensure you won’t fall down during an intense battle. Actually, the safety belt has an advanced sensor system to ensure the machine won’t work if you did not buckle the belt. With this thoughtful design, those young kids’ safety will have a great guarantee. Also, with this safety guarantee, parents will save their worries about their child. Usually, when you charge the robot rides for the first time, you have to keep it in charging around 12 hours. In subsequent times, it will just need 8 hours for full charging. Actually, robot rides in different sizes may have different battery volumes. For example, most of the robot rides have two pieces of battery, each of which features 24V/40AH. This kind of battery can sustain a battle of 4-6 hours with a complete charging. Fancy lights can always help create an exhilarating atmosphere for the battle. 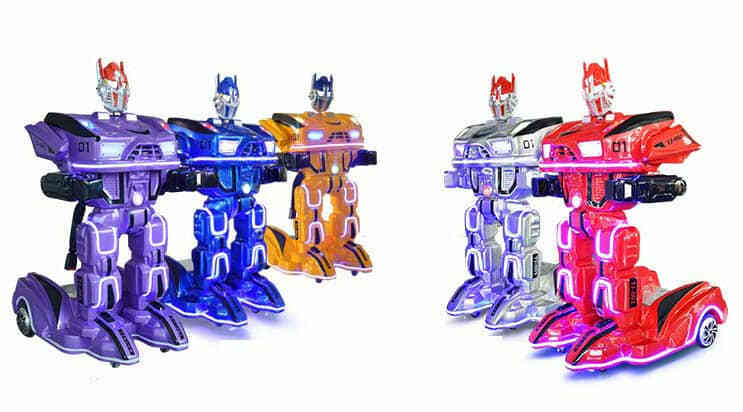 So, you can find that robot rides usually have various kind of lights covering their whole bodies. For example, hair side light, eye light, rectangle light, rhombic light, acrylic light, arms round light, crystal light, foot wheel light, pedal light, bottom light. All of these lights will give you an awesome experience during the battle. Particularly at dark night, standing by the battlefield, you will find out that in front of you is another kind of star war. How does it work or how can we play it? First, swipe your recognized card on the swiping area, then, you will get the admission to get in the robot ride. Second, you should utilize the handle, which is located on his stomach, to get on the chair. Third, after adjusting your body to a comfortable position on the chair, you have to buckle the safety belt. If you didn’t buckle the safety belt, the sensor built in the belt will not send out a command of starting the power system. With the three steps finished, you can get started to manipulate the robot ride. Usually, the robot rides have two kinds of working mode. For instance, if you want to start a battle, you may choose the play mode. In case you just want to have a simple preview, you can choose the demo mode. under this demo mode, your robot ride will rotate in a circle automatically. At the same time, it will play some dynamic music and show out flashing lights. Usually, the show time last for 1 minute with a subsequent interval of 1 minute. When you want to exit the demo mode, you can pull the joystick or press down on the “remote control” button. Most of the robot rides have a Double Potentiometers Rocker, which is used to control the moving of your machine. If you push two rockers forward at the same time, your robot ride will move forward. And the robot rides will move backward as you push these two rockers backward. Alternatively, if you push one rocker forward with another one backward, the robot ride will turn left or right. Whenever you want to stop your machine, you always need the brake mode to help you. Normally, when you release the rocker, it will reset to the initial position by itself. Then, the machine will stop outputting power and slide forward due to the inertia. Usually, the machine will slide forward about 1 meter away. What’s more, the robot ride has an emergency system for players. If some emergencies happened, you just need to push the rocker to the opposite direction to stop moving. In order to help the machine recognizes the obstacles and make a corresponding reaction of pausing. The designers have made a radar system to help them with intelligent recognition of obstacles. In case there are obstacles in front of or at the back of the machine, the robot ride will stop heading for the obstacles. Once the machine has stopped, you can only choose to move in the opposite direction. Otherwise, you have to remove the obstacle to bring it back to move. Move forward and backward, turn left and right: Users could easily control the robot rides and make it move forward and backward. Also, by pushing the rockers, you can easily help it turn left or right. Radar function: It has equipped itself with radar function. With the accurate detection of the radar system, you can avoid the collision between two machines, or between the machine and any obstacles. This is considered as a powerful precaution to help reduce accidents. Laser gun: The laser fun enables the interactive fighting for all the players. Usually, most of these kinds of machines are equipped with 6 pcs laser receiving boards. That will make sure you will have a completely interactive experience. Rotation of 360 degrees: Employing the advanced technologies, you can make a rotation in a whole circle at a time. That will also be an exciting part of this game. Digital display: From the digital screen, you can see the number of every hit. This number will let you know whether you have won or not. Adjustable speed and sound volume: We have told you there is a control panel between its two legs above. By using the different buttons on the panel, you can easily adjust the music volume or change the gear. Human-like voice: The robot rides have employed advanced technology to make itself speak like a human. This feature will make you feel more like you are fighting in a real battle. Awesome lighting effects: As we have said above, the robot ride will have various kinds of lights spreading over its body. These fancy lights will get you a visual feast and make your riders more attractive at dark night. Long-lasting battery life: Usually, a robot ride can work continuously around 8 hours with full charging. Such a lasting working time will make sure players can start a fight whenever they want to. As one of the best playground equipment, the robot rides becomes more and more popular among those play centers. In the future, you will see more and more robot rides in shopping malls, theme parks and carnivals, indoor or outdoor playgrounds, fairgrounds, amusement parks, and funfairs. It will soon become the landmarks of the commercial playgrounds. Around the world, there are many indoor playground equipment suppliers can provide such kind of robot ride for the indoor or outdoor playgrounds. 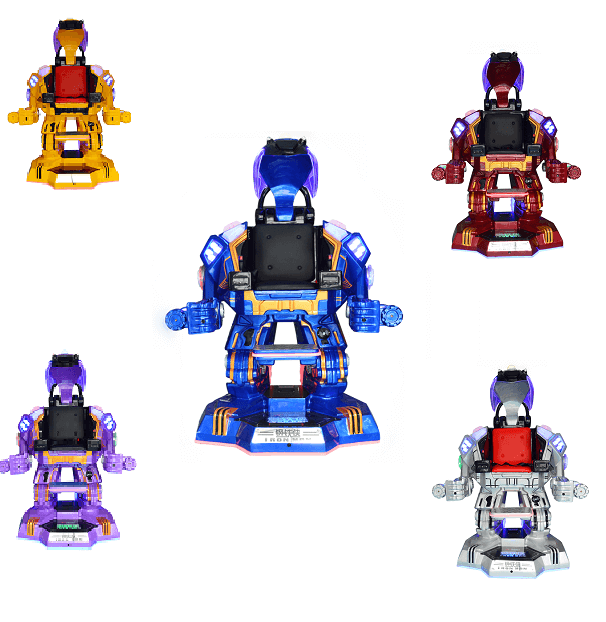 Wonka Playground, who already has cooperated with over 500 companies in the worldwide, can also manufacture the high-quality robot rides. You can contact them for detailed information. This entry was posted in blog and tagged arcade game.